Last night I prepared to watch President Barack Obama's Address to the Nation about the latest continuation in the war with Islamic Terrorists, the SIS or ISIL threat in Iraq and Syria. Megan Kelly on Fox News interrupted her broadcast to show the twin beams of light thasat had, seconds ago, be illuminated on the site of the 9/11 attack. It is a beautiful site, a beacon of strength, hope and spirit. 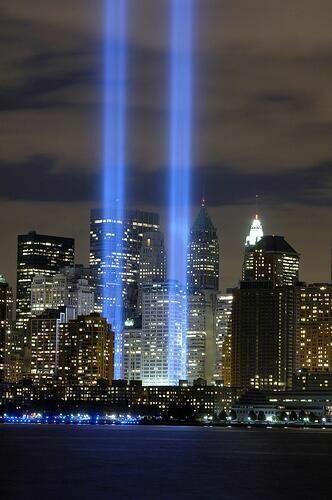 And yet here we are, thirteen years later, facing the same threat that destroyed so many lives on Spetember 11, 2001 and we face the same threat, perhaps even greater. It is a threat based entirely on blind hatred. Can we ever possibly overcome that? Are we doomed to an ageless war that will eventually destroy us all? September 11, 2001 was horrific. In a few short hours 2,996 were murdered by the same terror from Islamic Fundamentalists that threatens us today. We will make it through today? Last year the terrorists attacked Benghazi on the Anniversary of 9/11 just to commemorate the anniversary of the attack. Our Ambassador and three others were murdered. 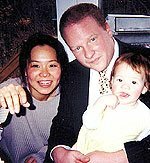 Since 2006 I have maintained my own small commemoration of the tragedy that was 9/11 by repeating here in this blog the story of Sue Kim Hanson and her husband Peter and their beautiful daughter Christine who were killed in the holocaust of 9/11. I've placed a series of links at the bottom of this post to each of the preceding eight years of blog entries. Last year I wrote that I hoped we might eventually learn to replace hate with love if we focus on the people, their lives, their loves, hopes, fears and dreams. With a heavy heart this morning I light again that small candle of hope. I believe understanding and love may somehow overcome hatred and evil. At least I pray so in the memory of Sue Kim, Peter and Christine. 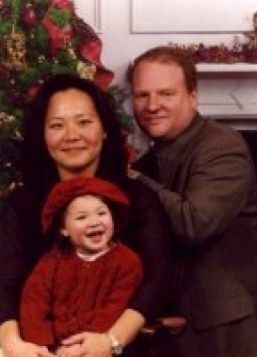 Please join me in remembering Peter Hanson, the handsome, young software engineer, Sue Kim Hanson, his Korean-American bride, and their two their old daughter, Christine. The Hanson's were killed when United Flight 175 was hijacked by the terrorists and purposely crashed into the World Trade Center. Sue gave a great deal to Boston University and she gave a great deal to all of us. 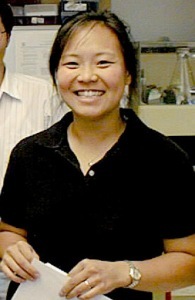 Her work in immunology inspired her fellow students, faculty and the University to continue her research and finish her thesis. They awarded her a doctorate degree. And they established the Sue Kim Hanson Lecture In Immunology, not just to honor her memory, but to give full credit to her work and the inspiration, the strength and the courage Sue provides to us all.